The Savage is an evil machine for long distances. It is a fun, simple bike that is light and narrow and fantastic for around town and shorter trips. Well, Daytona's out of the question this year as I have nobody to go with me. So, that saves even more money for the AMA conference. Lion, you're in MD right? When it gets closer, you wanna finalize routes and cross paths somewhere around day two? I'm definately good for at least 600 miles a day of interstate, probably 450 or more on the side roads. coffee_brake wrote: The Savage is an evil machine for long distances. It's not the bar as much as it is I feel like the whole bike is going to vibrate apart. The gel gloves work well, but it's an all-over shaking that's getting to me. My mirrors worked themselves loose on the Ridgeville run. And it's the best reason I've got for bike shopping sooner rather than later-just dunno which one yet I will be keeping the S40 for the rush-hour commute, though. It is the nature of a single-cylinder bike to vibrate very badly. My husband just picked up a KLR 650 (another single) and he likes it just fine, but for long distances you really have to take measures to combat the vibrations. Lots of people think that in-line four-cylinder engines are just for race-bikes, but they are also very very smooth and I LOVE them. I've ridden the BMW twins, parallel twins, Harley twins, and lots of singles, but nothing pleases me like the inline fours and the V-fours (like the VFR and my fantastic Vmax). On my inline fours I can ride all day for days on end and never leave the saddle except for the bathroom and the sleeping bag. They're just "my thing." You're going to have a great time hunting your bike! Hey next time I'm headed to Charleston I'll PM you, I really really need some Duke's Barbecue! Don't rule me out as a possible fellow rider yet, LL and c-b! I'm taking the ERC, bought the "Ride Like A Pro" DVD, and hubby & I are taking the ASMI class this weekend on motorcycle accident preparedness. I put 150 miles on the Versys in 2 wet, windy days and hardly noticed. Would have kept riding if the hands weren't freezing. And, after today, the temp goes up above 40 degrees, YAYYYYYYYY! SC, I had to change bikes, too. For me, it's the Versys. Managed to get it lowered to 29 inch seat height, so I can at least touch down enough to walk it backwards while seated. But it's top heavy, so while the gearing is friendly enough, it would not have been a good first bike for me. But it's a great bike now! cb - I'm open for routes. My one "really wanna do" is see the Arch in St. Louis. My buddy let me ride his new Versys around the parking lot, what a sweet-handling machine! After a cruiser it's top-heavy, but for a good all-around motorcycle it's not top-heavy at all! You're gonna love it for the long haul! I guess St. Louis traffic is going to be mucky for a while--there's an above-average amount of construction from what I understand. It also has a higher-than-average crime rate. Yup, love the Versys. Love, love, love it. And that's when it's cold out. I'll love it even more tomorrow, when it's 55 degrees!! 'course, I dropped it today practicing slow-mo manuevers. The hard saddlebag is scuffed, and the clutch lever a little dinged, but that's all. I should have stopped practicing a minute sooner, but, noooo, I was so pleased with how small I could circle, I did serpentines close to a curb. The curb was only a mental issue--I never touched it. But I had lost throttle, and instead of using more throttle, I went and looked at it. Amazingly, it was still there . . . and down we went. Poor bike. I apologized to her. Meet me in Saint Louis anybody? SO... been plannig, and thinking and researching. I expect to make St. Louis late on Day 2 of my ride to Colorado. I want to see the Gateway Arch up close, get some pictures, then head west of the city and get a room for the night. Now you other "easterners" who are thinking of making the trip... we could meet there and head west. EDIT: At the least, we could meet at a hotel west of the city, and start out together in the morning. Waiting around in the Arch parking lot, after a long day's ride, isn't sounding like a good idea, today. A good concept, but . . . We'll be coming from different directions, and traffic and what not, could spread out our "window of convergence" to several hours. Last edited by Lion_Lady on Sat Mar 21, 2009 8:12 am, edited 4 times in total. Meeting at the Arch--now that is a cool idea!! 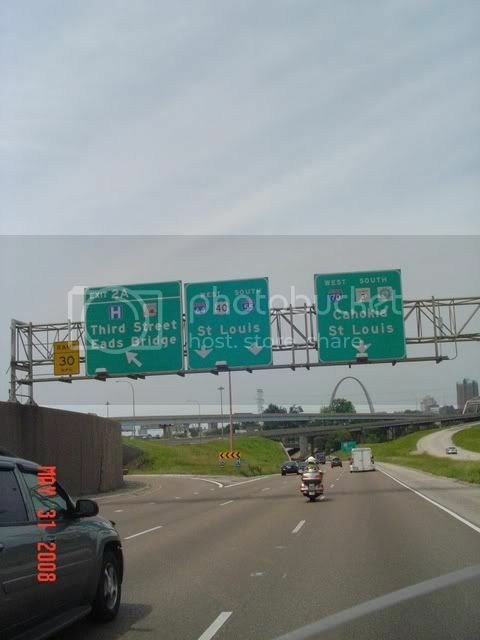 MZ33 wrote: I guess St. Louis traffic is going to be mucky for a while--there's an above-average amount of construction from what I understand. It also has a higher-than-average crime rate. Oh, and I just saw a feature on the FoodNetwork about a killer BBQ place in St. Louis!!! Other folks have offered to "share" another barbecue joint outside of Kansas City... this is shaping up to be a bit of a barbecue tour. All these BBQ stops may slow down your trip, LL! I suppose you'll divvy them up between coming and going? Or will it be dinner BBQ in St. Louis and lunch BBQ in KC?? Maybe this trip will call for a flip-up helmet! Eat and run! Hahah can you imagine the tailgater's face when you toss a mustard-sauced wad of BBQ pork on their windshield?! Well. I registered for the Conference! Also reserved a room (condo AT the Conference Center, $89/night before taxes, etc). I will happily share the space, and cost, if anybody's interested. I opted out of the house option. The "crowd" of ladies that were supposedly planning on riding out from MD seems to have dwindled, and the others planning on riding are gonna take 7 days to get there. How many roommates are you looking for? And, when you registered, did they list any sign-ups yet for seminars? So far there will be 2 of us coming from Vancouver. It's time to start planning. 2 from Vancouver? Do you have a riding buddy? MZ33 wrote: 2 from Vancouver? Do you have a riding buddy? MZ33 wrote: How many roommates are you looking for? And, when you registered, did they list any sign-ups yet for seminars? I figure how ever many are interested in "sharing" and how many are inclined to share a bed or need one to themselves, etc. That will dictate how many rooms/beds I should look into. The room I got is an efficiency/one bedroom (need to get the details on that) AT the resort. One other person would be great, two would bring the per person cost down more. (Rate is $90/night for 5 nights). I'm a non smoker, so I suppose I ought to put that out there. I'd prefer to room share with non-smokers, but I can be flexible... (okay, to a point - we can talk).